Asthma is a condition that affects your airways - the small tubes that carry air in and out of the lungs. People with asthma have airways that are almost always red and sensitive (inflamed). When a person has asthma their airways react to a trigger by becoming narrower, as the muscle surrounding the airway tightens and inflammation inside the airway leads to swelling and a build up of mucus. This causes a cough, wheezing or breathlessness. It is difficult to predict who is going to develop asthma. Like eczema and hayfever, it often runs in families and may be inherited. It can develop at any age. 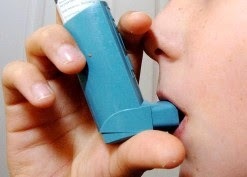 About one in seven children and one in 25 adults in the UK have asthma. It is important to try and identify possible triggers: talk to your doctor or nurse about avoiding them. Most asthma medication is delivered using an inhaler. This makes sure that very small amounts of medication are delivered directly into the lungs. There are a variety of inhalers available. It is important that you use an inhaler that you are comfortable with and that is available with the appropriate medication. Your doctor or nurse will help you decide which is the most appropriate inhaler and should show you how to use it correctly. There are three types of medication to treat asthma - relievers, preventers and protectors. 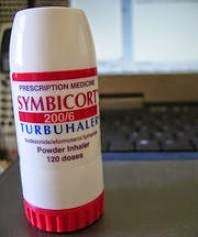 Reliever inhalers are usually blue. They act by opening up the airways by causing the muscles to relax and so allowing you to breathe more easily. You should only use the reliever when the symptoms of asthma appear or, if recommended, before exercise. They do not reduce the inflammation in the airways. If you need to use your reliever three times a week or more this may suggest that there is inflammation in your airways and so you need preventer treatment. PreventersPreventer inhalers are usually brown or orange They work by reducing the swelling and inflammation in the airways and can take between 10 and 14 days to build up the preventive effect. You need to use them every day, even when you are well. ProtectorsProtectors are long-acting medicines which reduce asthma symptoms and work by keeping the airways open and relaxed. This makes it easier for air to get in and out of the lungs, and so helps to ease asthma symptoms. They are available as inhalers or tablets. A protector would usually be taken with a preventer. Like preventers, it is important that you take protectors every day. Asthma symptoms can happen at any time. It is important to understand what to do if you feel your asthma is getting worse. Your nurse or doctor may provide a peak flow meter to help you manage your asthma. A peak flow meter measures the performance of your lungs. The meter has a marker which slides up and down as you blow into it. The marker stops at a point where you blow hardest. Each time you use the meter (usually morning and evening) you mark the result on a chart. It gives you a very clear idea of how you are controlling your asthma. Your doctor or nurse may discuss a management plan with you. This enables you to take control of your asthma. The management plan has a step-wise approach. Each step shows what treatment is needed to control your asthma. If the treatment on one step is not controlling your asthma your doctor may recommend increasing your medication. If your asthma is well controlled your doctor may well consider reducing your medication. Asthma should not get in the way of you leading a full and active life. Always carry your reliever medication with you. It is important to know what might trigger your asthma so you can avoid triggers. Also, take your preventer medication regularly so that your asthma does not deteriorate. • Continue to take reliever medication every few minutes until help arrives.